As frigid temperatures besieged the state, Best Cleaners wrapped up the ninth annual COATS FOR CONNECTICUT campaign this month, making the last delivery of donated coats to Salvation Army centers around the state. Thanks to all of you, we had another record breaking total of 18,298 coats processed during the eight-week community collection. 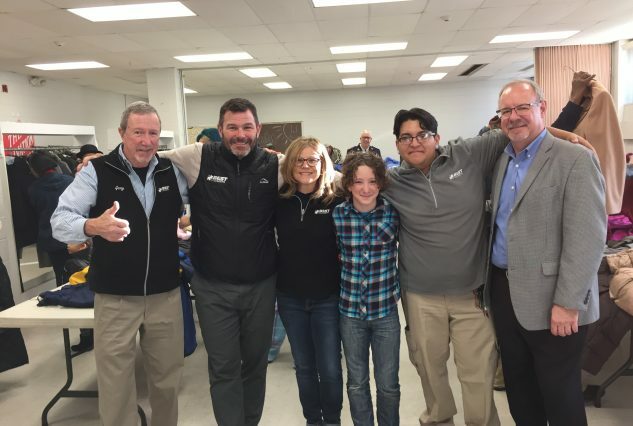 The extreme cold and expanded participation by local schools, youth groups, businesses, and Best’s campaign partners, Eyewitness News WFSB-TV 3, Young’s Printing/FastSigns and Gorilla Graphics, contributed to the continued increase in donations. WFSB collected over 600 coats in one day at their station headquarters, while many local organizations also held their own collection events. The total value of the donated coats and drycleaning services combined is an estimated $519,000, all distributed directly to those in need through Salvation Army centers and shelters in Hartford, Middletown, Meriden, Bristol, New Britain, New Haven, Bridgeport, New London, and Waterbury. Our warmest thanks for your overwhelming generosity and support. Pictured above (from l-r) are Best Cleaners team members Gary Reynolds, Shawn McCann, Laura Mullaly, Kevin Mullaly, Scott Franco, and Norm Ravagnani after making a delivery at the Salvation Army Center in Hartford.